Summertime has finally set in here in North Texas. That means temperatures in the 80’s at night, and hundreds in the daytime. Folks in Dallas and Fort Worth rejoice at the south wind that blows their pollution north, where it settles right here in Denton and Denton County. What a joy. Over this past weekend, I returned to the northern reaches of Lake Conroe to see if I could create some new photographs of grass carp for an article in Lone Star Outdoor News. Not only did I not get to shoot images of grassies, there were no grassies – none to cast at, and none to photograph. I enlisted the assistance of Houston fly fisher Danny Scarborough, who filled me in on the happenings at Orvis in the Woodlands, TX. Apparently, the big push into carp fly fishing by Orvis nationwide has several different aspects to it, and the Woodlands store is hosting a contest for the smallest and ugliest carp. Funny thing, those are two very difficult carp to find. Experienced fly fishers who target carp know that smaller fish are harder to catch than larger ones. I have yet to see an ugly carp. Danny’s strategy was to register at Orvis, and leave to go fish, while other registrants sat through lectures (marketing) at Orvis Saturday morning. I couldn’t agree more, and staring into the fly fishing demographic abyss is why I agreed to become an active part of the new blood being injected into what I considered one of the “old stodgy” organizations – the International Federation of Fly Fishers. My role as a “Region Director” for the North region of the Texas Council will take me to the Dallas Fly Fishers meeting tonight in Dallas, and to the Red River Fly Fishers meeting tomorrow evening in Sherman, Texas. I am not much for titles, and have a fundamental suspicion of most organizations, but publicly voiced intent to change the tenor of the Federation, and attract a younger, more vibrant and energetic crowd, was hard to resist. Say goodbye to the word “enclave” for example! I will get out and take a look at the carp community later this week, and let you know what these overnight high temperatures mean for guiding for carp here in North Texas. Of course, I have to assume local Orvis workers, and endorsed guides are smart, and taking every shortcut – including reading my reports on the carp community they are now focused on. Please take the time to sign up for my newsletter – in the left column “Mailchimp” box, and that information will arrive in your e mailbox. So far this summer, we’ve been in this suspended state where fly fishing for carp has been a deeper water affair, but things could be “normalizing” as we approach the hottest days of this calendar year. Whether or not we will be aboard a Mitzi Skiff this year? That is still a mystery to be solved, but I am completely confident that Texas Fly Caster guide services will include new and exciting ways to stalk carp NEXT season. With the drought gripping common carp grounds, this is a good year NOT to get too deep into the time consuming upgrade in platforms, although training/learning in winter doesn’t sound too appealing either. Meeting and fishing with good characters like Danny Scarborough over in Houston, gave me the idea to run occasional fly fisher profiles, called “Fly-O-Files.” You may recall, Danny had put us on very nice redfish fly fishing in the Galveston, TX, bayous – fly fishing from kayaks. The Texas Fly Caster story on fly fishing for redfish in the shallow Galveston system ran about seven months before it appeared on the cover of the (great) publication “Southwest Fly Fishing,” and that’s all due to Danny’s local knowledge of the location and the fish. 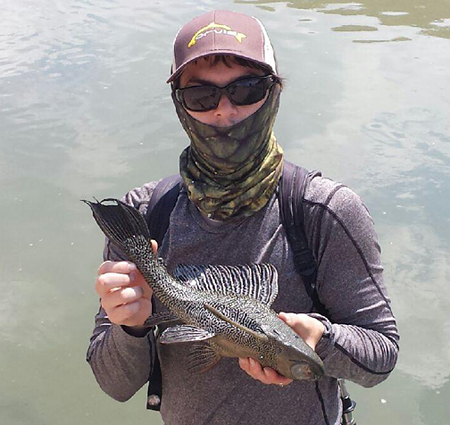 Right now, Danny is fly fishing the concrete drainages of Downtown Houston, Texas, targeting carp, and catching strange aquarium fish like the one ID’d below as a “Pleco,” which he said are all over the place. 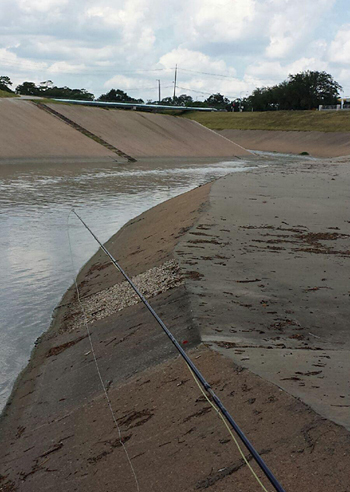 Urban fly fishing warfare at its best! Awesome! Thanks for having me in your column! I look look forward to fishing with you again and CATCHING fish. I guess I need to subscribe to Southwest Fly fishing. Whens magazine coming out?